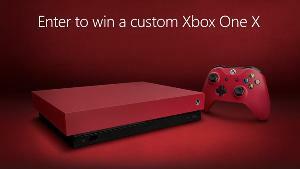 Prize: Grand Prize: custom-branded Xbox One X console; Xbox Wireless Controller – Red; $60 Microsoft Store gift card; 12-month Xbox Live Gold Membership ($683). (10) 1st prizes: Xbox Wireless Controller – Red ($124.98). What you must do to enter: Retweet the post. Statistics: This contest was opened by 114 and entered by 13 ContestChest.com members. 11% of those who opened the contest, entered it.